Plenty of sunshine. High around 80F. Winds W at 5 to 10 mph..
Maps are a valuable resource to historians. 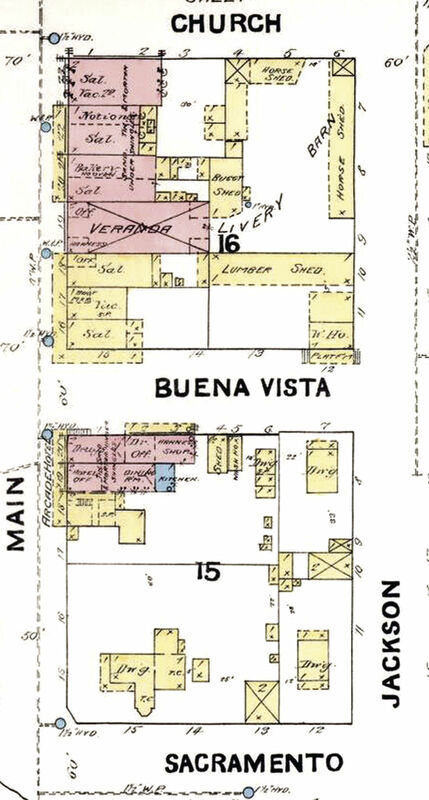 This section of an 1891 Sanborn Map shows what types of businesses occupied the buildings bounded by the named streets. During Ione’s early days nearly every small building along Main Street, at one time or another, housed a saloon. Pictured here, circa 1920s-1930s is the entrance to the saloon that occupied the northeast corner of Main and S. Buena Vista Streets. That slanted doorway is still there. The building that stands between Tilly’s Club and Clark’s Corner was home to a variety of businesses during Ione’s early years, including several saloons, a notions store, a barber, and a theater that sported two stages. Many Ionians will remember it as home to the town’s movie theater. Pictured here is the building that housed the Arcade Hotel and Ione Drug Store. It was constructed around the first log cabin built here in 1850 by John Marshall Wooster. Standing in front of the hotel are (left to right) hotel proprietor Alfred “Mack” Amick, J.P. Horton, and Drugstore owner Dr. Abner Lafayette Adams. This view of Main Street in Ione, looking east, was taken circa 1890. Maps are a wonderful thing. They can direct us to locations we’ve never been before and symbolically illustrate particular physiognomies of a place. They inform us of the cultural and topographic world around us and provide us with our position within that world. With the introduction of digital maps accessible on electronic devices, paper maps have become obsolete for many people, but not for me. In my line of work, historic maps are a valuable resource. They offer the researcher a view of a specific area during a particular time period. A snapshot, if you will, with significant information that can be used to interpret history. The facts illustrated on a map can then be used as clues to research other historic documents related to the area. In addition, combining data from different types of maps, overlays, if you will, is also beneficial to the researcher. Take for instance a historic topographic map of a particular region compared to a tax assessor’s map of the same area. The topographic map will show the physical layout of the land, whereas the assessor’s map will show where property was taken up within the same area. With this combined information, the researcher can propose a theory as to how the topography influenced settlement patterns. Historic maps produced by tax assessors, when examined in conjunction with fire insurance maps, are exceptionally valuable when probing into the history of a particular town. They provide both the layout of the settlement, as well as the specific types of buildings and the names of those who occupied them. So with historic maps in hand, I’ll guide you through and explore some of the businesses and townspeople of Ione during the last two decades of the 19th century. For those of you unfamiliar with the founding of Ione, we’ll begin our narrative with a little background. John returned to the east in 1851 and then the following year came back to California with a mule train. With him and others were another pioneer Amador couple, Abner P. Clough and wife Caroline. In 1853, John Wooster sold most of the land along Sutter Creek to Thomas Brinley Rickey. George Wooster returned to New York but John stayed in California and later married Mary Clough, the daughter of Abner and Caroline. About 1856, John and Caroline went to Altaville, near Angels Camp where he built a foundry. In the early 1860s, John sold out his interest in the foundry and moved to Sonora where he erected another foundry which burned in 1867. Wooster then took his family to live at Fruitvale and built yet another foundry at Oakland Point. It was at his machine shop here that he is said to have forged the machinery for the first river steamboat built on the Pacific Coast. From Fruitvale the family relocated to Oakland Point and then to the Meadow Lake region in Nevada County. Meadow Lake City was a mining boomtown. Wooster’s Oakland Point Foundry forged the machinery for a number of the mills. After a controversy over payment for some of the mill machinery, Wooster established his own mine mill a couple of miles west of Meadow Lake City. After this John took the family back to Oakland Point in 1868, he fell ill and unable to work. The family then returned to Amador County to live in Pine Grove with Mary’s parents. John died on December 24, 1869. This early Ione pioneer is also credited with building the first foundry in Sutter Creek a few miles east of Jackson. When Thomas Brinley Rickey purchased Wooster’s land in 1853, he set out to establish a town along the banks of Sutter Creek. Rickey came to California from Iowa in 1850, in company with his son James and his older brother James. Brothers Thomas and James parted ways at Salt Lake. James headed to Salem, Oregon while Thomas and son continued on to California. After mining for a time at Placerville, Rickey and son returned to Iowa to bring the rest of his family out west. They left Dubuque, Iowa in February 1852 and arrived in Volcano in August. The following month they relocated to the Ione vicinity where Rickey took up a 160-acre tract of land which straddled Sutter Creek. In 1853, Thomas hired S.H. Marlette to survey the property that would become Ione City and lay out six block of town lots which he soon sold off to settlers. Two of those first settlers, Dr. E.B. Harris and H.A. Carter, took a trip to the state legislature in Benecia (the capitol of California having not yet been moved to Sacramento). During their visit they discovered that a land claim, the Arroyo Seco, had been field in the General Land Office. The grant took in 11 square leagues of land, including the town of Ione City. The document, field by Andres Pico, a Mexican California, stated that Governor Juan B. Alvarado had granted the tract to Teodocio Yerba in 1840 who sold it to Pico in October 1852. The document was questionable; however, the settlers protested. Many, afraid of being ejected from their property, paid Pico for the land while others, determined to hold their ground, ignored Pico’s claim. Pico, tired of the battle, sold the grant to J. Mora Moss, H.W. Carpentier, E.F. Beale, Herman Wohler, and several others. These partners employed the military to eject the settlers which led to several violent confrontations. However, after several years of fighting the matter was finally settled in the courts in 1865 and the settlers prevailed. Over the next three decades Ione would become a thriving settlement and a crossroads for commerce. In 1888 the Amador County surveyor’s office drew up a townsite map of Ione which provides us with the names of property owners at that time. Two years later the Sanborn Fire Insurance Company also produced a map of the town which describes what types of buildings occupied the town lots. Using these maps as our guides and information from historic documents, we begin our snapshot of Ione’s Main Street during the last decades of the 19th century. We commence our tour on Main Street between Sacramento and South Buena Vista Streets. For many years the westernmost lot on this block, at the intersection of Sacramento and Main, was occupied by a residence. To the east of this, the lots occupied Caldwell Banker, Robyn’s Nest, and The Edge, were home to the Arcade Hotel and the Ione Drug Store. This building was built around Ione’s first log house, constructed by John Marshall Wooster circa 1848. His one-room cabin became the sitting room for the Arcade Hotel. The hotel was owned by Ellis Grant Amick and the drugstore operated by Dr. Abner Lafayette Adams. Ellis’ father, Alfred Jefferson Amick was one of the earliest settlers in the Ione Valley who purchased this property from Pico before he could be ousted during the grant conflict. In addition to the drugstore, Dr. Adams, cared for patients in his office located behind the drugstore. Adams, a native of Arkansas, received his medical education at the St. Louis Medical College. He came to Ione right after his graduation from that institution and set up practice in Ione in the 1870s. Adams also invested in a number of mines and was one of the trustees who founded the Ione Academy, the first high school in Amador County. Behind Dr. Adams’ office was a harness shop, a shed, and a wash house. The Arcade Hotel building caught fire in 1889 and burned to the ground but was rebuilt. By 1898, the hotel portion of the building was home to a saloon and billiards hall with rooms to let on the second floor. Dr. Adams maintained his drugstore and practice next door until 1926 when his health began to fail. Moving on to the next block on Main Street, between South Buena Vista and South Church Street (Hwy 124), many of the buildings that occupied this block were saloons. The building that now stands on the northeast corner of Main and S. Buena Vista Street was originally built as two separate structures. The building immediately adjacent to the corner was for many years one of the aforementioned saloons. The building next to it lay vacant at the time but by 1898 it was home to a meat market and after the turn of the century housed an electrical supply store and a barber shop. At one time, a portion of it was home to a stage where entertainments of various types were performed. In 1888 these two structures were owned by Thomas and Dan Stewart, who also possessed a number of other properties in Ione. You’ll learn more about these brothers, later in this narrative. The next business to the east, where Dr. Eaton practices dentistry, was also a saloon in 1888 owned by Phillip Henry Kennedy. He was by trade a carpenter but after an injury left him with a lame left ankle, he took up keeping a saloon until his death in 1899. By 1912, it was home to a print shop and a barber. Later, the barber moved into the Stewart building and Kennedy’s saloon became a restaurant. On the next lot, once stood the Veranda Livery and Feed. Behind the entrance fronting Main Street, the business took in the lot behind it, extending to Church Street behind the adjacent buildings. There were back entrances to the barn on both Church and Jackson Street. The Veranda Livery was operated for many years by brothers James P. and John Whitten Surface. The brothers came to California in 1851-52 with their widowed mother, Almira Cecil Surface and three siblings. Almira was one of the first to operate a millinery shop in Ione. James eventually sold his part of the livery business to Robert Ludgate and subsequently worked at various professions. When John sold his portion of the business to Ludgate, he went on to found a bank in Ione, the first bank opened in Amador County. Robert Ludgate, a native of Ireland, came to America with is parents as a young boy. They settled in New Orleans but Ludgate left there and came to the Ione Valley in the early 1850s where he took up stock raising and farming. Robert also served in the California State Assembly from 1877 until his death in 1878. With the population transitioning from animal-powered transportation to the automobile, the livery stable eventually became home to a garage. To the east of the livery stable, where Tilly’s, now stands, were two small lots that housed various businesses over the years. In 1888, the property was owned by Joseph Whittaker who operated a restaurant. By 1891, his building was divided into two businesses. The western half was home to a saloon while the eastern half housed a bakery that did not have an oven. Within the decade the bakery was closed and another saloon took its place. By 1912, a combined confectionary and restaurant occupied the eastern half and the westernmost unit was home to another barber. The barber eventually moved out and was replaced by a pool hall while the confectionary next door eliminated the restaurant and added tobacco products to their goods for sale. While Whittaker was in business, William Scully owned the two lots to the east. Ionians will recognize this family name. William arrived from Ireland in 1852 and purchased property in the Ione Valley from J.P. Martin who first settled there in 1848. Their two-story brick home, built circa 1852, is on the National Register of Historic Landmarks. The Scully family has owned the property and ranched it for five generations. Scully’s town lot has housed a number of businesses over the years. Like other buildings in this block, it was divided into two spaces. In 1891, a notions store and a saloon occupied the spaces. By 1898, the notions store had closed and a barber took up residence. Sometime around the turn of the century, it no longer served as retail space. Each space sported a stage where plays and concerts were held. As most elders in the Ione community will remember, the building eventually became home to the Ione movie theater. If one carefully examines the face of this building, they will see the vertical bricks that once formed the top of the doorway openings when it had two entrances. Last on this week’s tour of Ione’s Main Street is the building on the southwest corner of Church and Main Streets, formerly Orville’s Club and most recently home to Clark’s Corner. This building was also owned by William Scully for a time. Through the last decade of the 19th century, the building housed a saloon and billiard hall. By 1912, a grocer was on the first floor and the second story held apartments. Orville Horst took over the building in 1970. After he arrived in Ione he worked for his father-in-law and uncle at the Golden Star Bar and restaurant. When Orville bought the business from them, he moved it across the street where he operated his business for many years. Many will remember him as a collector of Jim Beam liquor decanters and for playing Santa Claus every Christmas.